Welcome to the March edition of the Microsoft Imagine Academy (MSIA) Newsletter! The MSIA program team has been busy building, updating, and collecting program news and success stories just for you! Read on for these and other stories. The Introduction to Developing Websites Using HTML & CSS course is now live! The course content will cover an introduction to the basics of HTML and Cascading Style Sheets (CSS). It includes lessons for an entire 14-week semester, or approximately 100 hours of instruction and hands-on experience with HTML/CSS. You can also introduce this course as a self-paced series of modules, or as a series of lessons and activities for an after school or lunchtime club. Students will need a browser, a text editor, and a willingness to explore and try things out! This course is also designed to prepare students to take the Microsoft Technology Associate (MTA) exam 98-383. Go to the Microsoft Imagine Academy member site to download the Introduction to Developing Websites Using HTML & CSS course now! We are happy to announce that the student Certificate of Completion for MSIA courses has been updated with a new look! You can customize the certificate with your school name, logo, and MSIA course name to celebrate your student’s success, and validate their completion of the course. Certificates are available for free and can be downloaded from the MSIA member site. Select the Classroom tab located on the left side of the ribbon. Scroll to down to Student recognition. Select and click on the file you wish to download. Download from the Microsoft Imagine Academy member site; we think you’ll like the new look! The American Council on Education (ACE) has reviewed and recommended Microsoft courses, Microsoft Technology Associate (MTA), and Microsoft Office Specialist (MOS) certifications for college credit. Students can request an ACE transcript and check colleges currently accepting ACE transcripts. We are currently working with ACE to expand College and University partnerships. 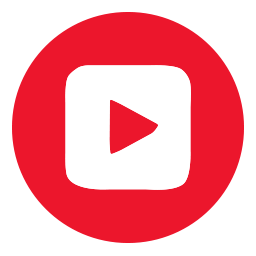 Watch this video and visit the ACE Credit website to learn more. For more information on ACE CREDIT's review process, click here. Your Microsoft Imagine Academy program membership includes access to Microsoft Official Academic Courses (MOAC) training materials on Microsoft Office Specialist (MOS) and Microsoft Technology Associate (MTA) courses. The MOAC series includes an integrated program of Student e-books and instructor resources designed for classes taught over a period of 6 to 16 weeks. MOAC course materials cover Microsoft Certification exam objectives for MOS and MTA exams through lessons based real-world scenarios and hands-on practice exercises. MOAC provides Educators with academic content to plan, prepare, and conduct hands-on classes, including course setup ideas, lecture outlines, teaching tips, PowerPoint presentations, and instructor guides. Access to MOAC is available through the Microsoft Imagine Academy member site. 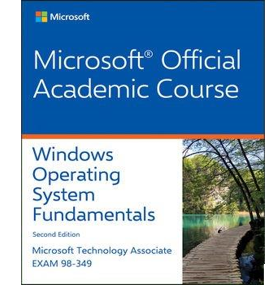 Microsoft Imagine Academy Program members are also able to purchase print MOAC textbooks at an academic discount. Visit the Microsoft Imagine Academy member site to find the current list of MOAC titles available via the MSIA program and to access course materials. 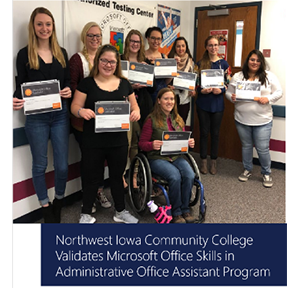 Northwest Iowa Community College (NCC), a Microsoft Imagine Academy, in partnership with the Iowa Governor’s STEM Advisory Council, is the college for more than 2,700 students with a placement rate that averages 98 percent. One of the college’s specialties is the Administrative Office Assistant program. It prepares students for a career as an administrative assistant. These students take two courses called Intro to Microsoft Office Applications and Advanced Microsoft Office Applications with an outcome for students to achieve their Microsoft Specialist Certification. Students aren’t the only ones taking advantage of MOS certifications. Janet Boone, formerly the assistant to the president at NCC, learned about Microsoft Office Specialist certification and soon realized it would help her identify herself within the college. From what began as a personal goal to become a Microsoft Office Specialist in 2000, Janet now holds a full-time instructional position within NCC’s Administrative Office Assistant program. “My Microsoft Office Specialist credentials have paid dividends for me, both personally and professionally, and I approach every day as an opportunity to teach my students to think critically and to learn workforce preparation skills,” said Boone. Learn more about Janet Boone’s professional journey and NCC’s Microsoft Imagine Academy partnership here. Ad Astra Per Aspera. To the Stars Through Difficulty. The Kansas state motto perfectly describes dedicated Kansas entrepreneur and Microsoft Office Specialist (MOS) certification holder, Katie Murray. The opportunity of local high school summer MOS certification courses led her to many educational and career successes. Not only did the MOS certifications double as college credits, but they also helped her attain an internship during her freshman year and support a new business venture as an entrepreneur. Find out how Katie has reached her dream job through focused effort and dedication at the Certiport website. Microsoft Imagine Academy educators are proud of their students’ success. We enjoy receiving stories from instructors and learning how MSIA and certifications have helped students succeed in school and finding their career path. Microsoft Imagine Academy (MSIA) team: How do you think having MOS certifications helped you get into college? 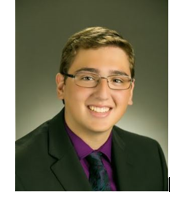 Eric Udlis (EU): I put the Microsoft office certifications on my college applications and had no trouble choosing from multiple college acceptance offers. The college I selected, University of Wisconsin Madison, is known as one of the harder UW colleges to get freshman acceptance. MOS gave me a competitive advantage to over other students applying for direct admittance to the College of Engineering. It typically requires a good GPA, ACT score, challenging high school classes, extracurricular activities, and decent essay. MSIA: Have you gained direction or motivation from your MOS certifications? 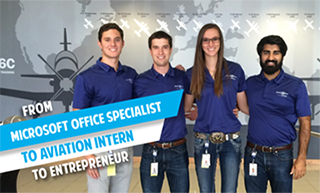 EU: My Microsoft certifications have allowed me to become an operations director at a student organization on campus. The position, geared to helping student startup companies, provides me the opportunity to work with entrepreneurs and startups, which is something I probably wouldn’t have if it weren’t for my MOS certifications. MSIA: Have you gained employment from Microsoft certifications? EU: I recently applied for and accepted a job offer from Moraine Park Technical College to teach a kids’ summer camp where I will need to use Office to present lesson plans, track course fees, and write up handouts. MOS certifications in Outlook, Word, Excel, and PowerPoint most likely set me apart from other camp instructor applicants. Meet Sasha Ariel Alston, a 19-year-old Pace University student who is pursuing a major in information systems and a minor in marketing. She is passionate about coding and spreading the news about STEM to girls, especially to girls of color. 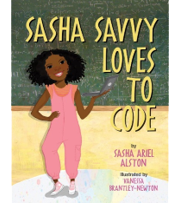 She recently published a book called Sasha Savvy Loves to Code, a children’s book about a ten-year-old girl like Ms. Alston who loves to code. Remove traditional technology related gender stereotypes: Find and share stories about women in STEM related fields with all of your students. Feel free to share MSIA newsletter success stories with your students. Present a variety of ways technology can be used to peak student curiosity: Find an MSIA Learning Path that excites them to use technology in areas that interest them. Introduce female science and technology mentors: Find female mentors in your community and involve them in your classroom. Enable them to share their story like Sasha. Learn more about Sasha Ariel Alston through her interview with HuffPost.